Barcode Generator Software - Professional Edition is effective barcode creator tool that allows you to design barcode labels, stickers and tags in linear and 2D barcode font standards. Professional barcode generator software helps you to create printable barcode labels, tags and stickers. Barcode label generator software has inbuilt barcode designing view to create barcode labels using different barcode designing objects like text, line, ellipse, rectangle etc. Click on 'Barcode Designing View' and design your own style of Barcode Label. 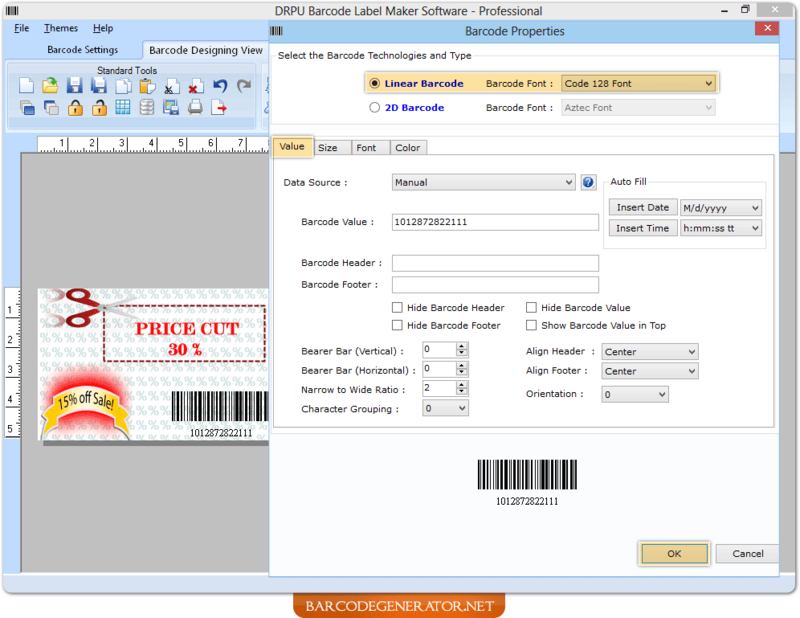 In Barcode Properties, Select Linear or 2D barcode font and set Barcode Value, Size, Font and Color. Coda bar, Code 11, Code 128, Code 128 SET A, Code 128 SET B, Code 128 SET C, Code 39, Code 93, Code 39 Full ASCII, EAN13, EAN8, Industrial 2 of 5, Interleaved 2 of 5, ISBN 13, ITF-14, LOGMARS, MSI Plessey, Planet, Postnet, Standard 2 of 5, Tele pen, UCC/EAN-128, UPCA, UPCE, USPS Sack Label, USPS Tray Label, USS-93. Aztec, Databar, Databar Code 128, Databar Code 128 Set A, Databar Code 128 Set B, Databar Code 128 Set C, Databar Expanded, Databar Limited, Data bar Stacked, Databar Stacked Omni, Databar Truncated, Databar EAN 13, Databar EAN 8, Databar MicroPDF417, Databar PDF417, Databar UPCA, Data bar UPCE, DataMatrix, MaxiCode, PDF417, QR Code, MICR Font. Professional barcode label generator software easily generates barcode labels, stickers and tags in less time. Barcode generator software uses random, sequential and constant value series generating features to create bulk barcodes. Linear and 2d barcode generator software easily generates multiple copies of labels using different barcode and text value. Professional barcode sticker generator software easily saves created barcode labels in different file format in jpeg, tiff, bitmap, png and wmf that can be printed by barcode printer or generally used printer. Barcodes generator software has inbuilt option to specify barcode value, barcode header and barcode footer.